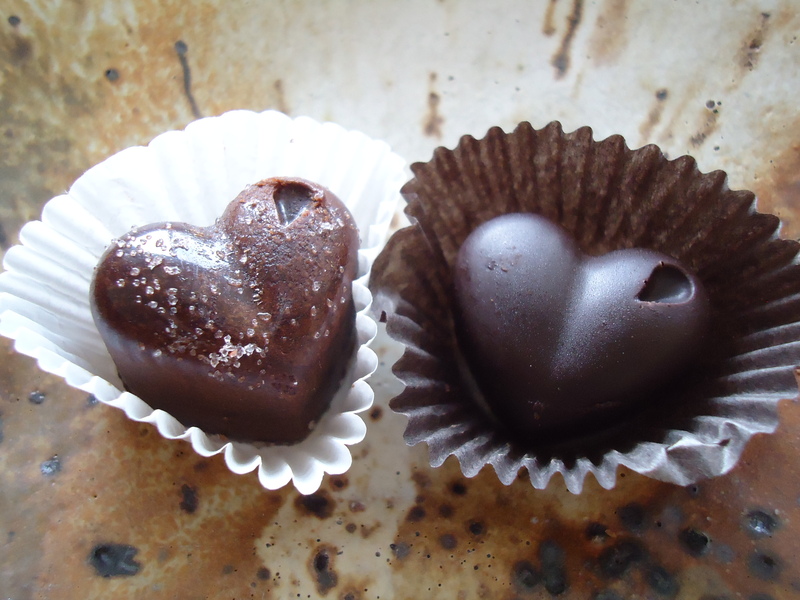 Dark Chocolate…YES, It’s Good For Us! Image courtesy of Evolution Through Chocolate, by Joseph Vernon. Word on the street says that chocolate is good for us. Goodness knows, I constantly hear, “Hey, it’s supposedly good for us now, I’ll have another piece!” or “Indulge, it’s ok, because it’s good for you!” I personally use the excuse all too often. But, the truth is, not ALL chocolate is good for us. 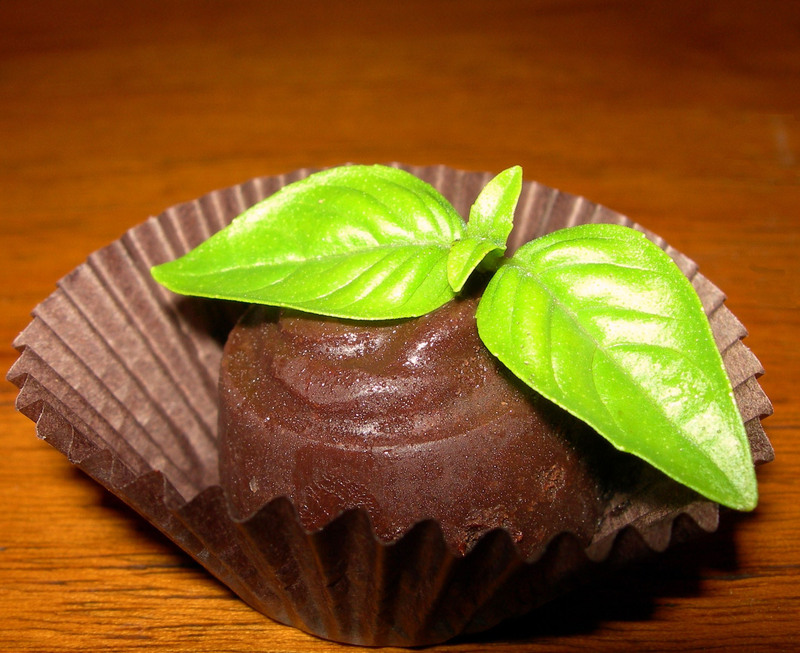 It’s the dark chocolate that packs the power punch of health benefits. And fortunately for me, the dark chocolate is my favorite. And speaking of chocolate, I absolutely have to share with you all… I recently discovered my new, all time favorite chocolates! Talk about a treasure of a discovery! I was at the fabulous salon, Shear Indulgence in Irmo, SC and one of the ladies there asked, “Would you like to try some amazing chocolates?” At first, my inclination was to be good and say, “Oh, no thanks.” Then she went on to brag a bit about this special chocolate. 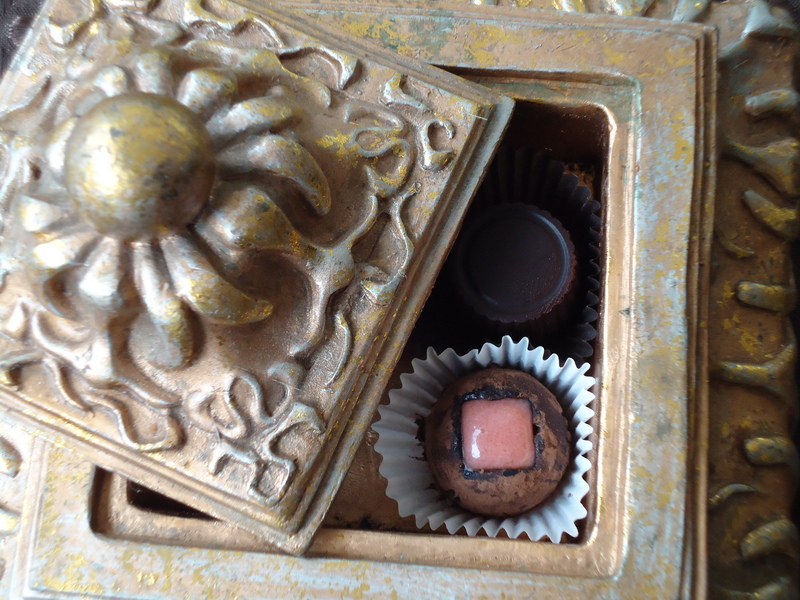 She showed me this lovely box filled with what looked like little treasures. I couldn’t resist. One bite was like a little taste of heaven. And I’m not kidding… this was the best freakin’ chocolate that’s ever been in my mouth! It was all I could do not to moan or sigh as I tasted this mouthwatering, glorious treat. The taste releases in your mouth as if it’s a little angel spreading its wings, gracing you with goodness and riches. And the aftertaste continues to bless you. I know it sounds a bit dramatic, but I kid you not, this stuff is out of this world. And I’ve had A LOT of different chocolates over my lifetime. Ever seen the gorgeous movie, Chocolat, starring Juliette Binoche, Judi Dench, Alfred Molina and Johnny Depp??? (It’s one of my all time favorites!) Well, these chocolates I had at the salon that day were like something straight out of that movie. And it’s chocolate that is so delicious and has such a punch of flavor that you get this overwhelming feeling that it must be good for you. Ok, ok,… I know you’re wondering, what is the name of this unbelievable stuff?! It’s called Evolution Through Chocolate – a.k.a. Etc. (Isn’t that a cool name!?) Joseph Vernon, right here in Columbia is the chocolatier genius behind this priceless creation. Check him out on Facebook to see where you can find his angelic treats. I know I’ve certainly become one of his number one fans. 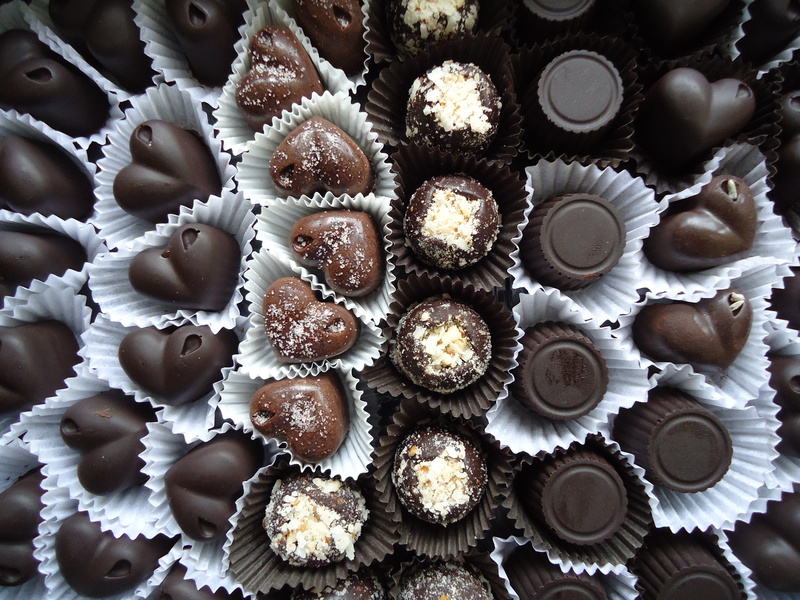 A Swedish study showed that women who ate one or two servings of dark chocolate each week cut their risk for heart failure by as much as one third. Now let’s be honest here, I could eat that much and more per day! I don’t want to have to limit myself to having that little amount per week! Not enough, I say! Another study done in Germany found that about a square of dark chocolate a day lowered blood pressure and reduced risk of heart attack and stroke by 39 percent. Now we’re talking!! Apparently, the flavonoids and the antioxidant compounds increase the flexibility of veins and arteries. Now am I telling you to cut your workout and just eat daily doses of dark chocolate? Of course not! We still need to work out. And here’s some more good news… when we reward ourselves with a dark chocolate treat after a long, hard workout, it can actually help lessen cravings for fatty, sweet and salty foods! Oh yeah! Dark chocolate can create happiness on all sorts of levels. For more details on the surprisingly awesome benefits of dark chocolate, check out this Women’s Health article: http://www.womenshealthmag.com/health/benefits-of-chocolate. Or, head over to the Lexington Medical Center official blog: http://blog.lexmed.com/2014/05/celebrate-national-chocolate-chip-day-may-15th/. And by all means, check out chocolatier, Joseph Vernon and let his angelic chocolates bless your taste buds. You won’t regret it! 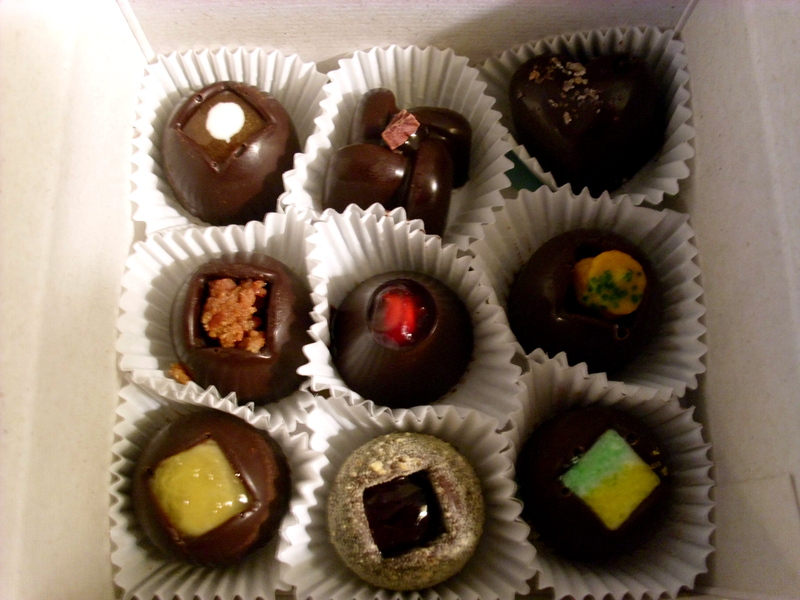 Just looking at these pictures of his chocolates makes my mouth water. An Evolution Through Chocolate indeed. An evolution I’m happy to partake in! This entry was posted in Food, Shannon Boatwright and tagged Chocolate, Columbia, columbia sc, every woman blog, Evolution Through Chocolate, Famously Hot, food, hospital blog, Joseph Vernon, Lexington, lexington medical center., lexington sc, Lexington Women, lmc, LMC every woman blogger, Midlands, Midlands Women, South Carolina, South Carolina Women, Women, women's blog, women's hospital blog by lexingtonmedicalcenter. Bookmark the permalink. Thank you very much for the high praise!